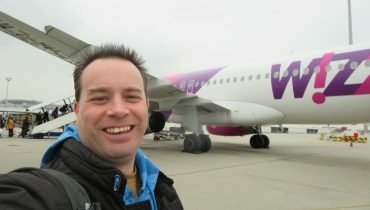 The reason I came to Cebu for a couple of days was for today – a day trip out to Bohol Island. I awoke this morning at 7am still feeling under the weather but this had to happen today or not at all as I fly to Boracay tomorrow morning. I sucked back some cough syrup, got ready and was out the door just after 8am. The girl at the front desk told me the ferry I needed to take left on the hour so the next one was 9am. I hailed a cab and told him I was going to Pier 1 but needed to stop at an ATM first to take out money. This confused my cabbie immensely as I think the only English that I spoke that he understood was Pier 1. After physically taking out my ATM card he finally understood and stopped at a bank. This was the first time I was using my bank card as I had left for my trip with $1400 in a mix of Philippines Pesos and US Dollars. Of course, the machine didn’t like me and after trying a smaller amount I reluctantly pulled out my Mastercard for a cash advance instead. I hopped back in the cab and told him I needed to go to another bank. Same result at the next ATM. Crap! Well, I did still have $200 in US cash so I’d be okay it’s just I had that cash specifically for visa fees/bribes for countries down the road. Now explaining I needed to go to a currency exchange place was not happening with this cabbie. I even showed him some US dollars and a Peso and did the exchange motion. Whatever, I figured we’d go to the pier and I’d find a currency exchange place down there. No currency exchange place down there. At least I was able to talk to the guard at the pier and have her explain to my cabbie what I needed. She suggested I go to Robinson mall so off we went. It was 8:40am and I was resigned to not making the 9am boat. The ride to the mall was taking forever so when I saw a currency exchange place along the way, I had the cabbie stop. The guy suggested I go to Robinson mall. By this point I was just kind of laughing at ridiculous this whole situation was as my taxi meter fare kept climbing. A few minutes later we hit the mall and rather than going inside in search of a money exchange, I first tried one of the ATMs lined up outside the mall. Debit card still didn’t work but *angelic music* my credit card worked!!! Relieved, I headed back in the cab and knew this ordeal was almost over – back to the pier, my man! When I originally arrived at the pier half an hour ago my fare was 113 pesos, now it was 230 pesos. Luckily it’s pretty cheap to take cabs here so I ended up paying the equivalent of $6 for the cab. It was 9:10 and I went over to the ticket booth for Ocean Jet to find that the times the girl had given me were actually wrong and there was a 9:20 ferry followed by the next one at 11:40. Oh man, I really wanted to catch that 9:20 ferry! After frantically waiting in line behind a tour group of 6 to buy my ticket (500 pesos), buying my terminal fee ticket (25 pesos), and then going through security I watched as the clock ticked past 9:20. No worries, the ferry was late. Yay!!! I boarded and we were off at 9:45 for an almost two hour ferry ride. All the seats inside were already sold so my ticket was for a seat on the upper deck outside. 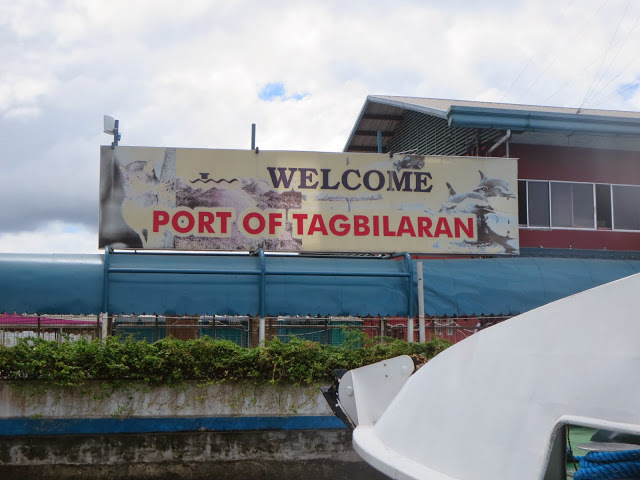 I wasn’t complaining – I was just happy to finally be going to Bohol after a stressful hour. At 11:30am, the ferry arrived in Bohol and I was hungry and really fighting my cold. As you get off the ferry you are inundated with dozens of people offering tours or trikes or vans or whatever. Trike? Trike? Where you go? You need a ride? I actually did but when I’m bombarded like that I just need to get out of that situation so I moved through the wave of people and walked down the pier thinking I would find some tour company shops on the main street. Well, there really isn’t a main street by the pier and it became obvious to me that I would have to head back into that hornet’s nest to find someone to take me to see everything at a reasonable price. At least when I headed back most of the people had left so it wasn’t as bad. A man named Rey approached me with his little placard of all the things Bohol had to offer me and asked me what I was looking for. He seemed friendly enough so I told him it was just me and I wanted to see everything. At first he offered a car trip at 2500 pesos ($60) but I told him that was way too much and I was looking for 1000-1500 pesos. 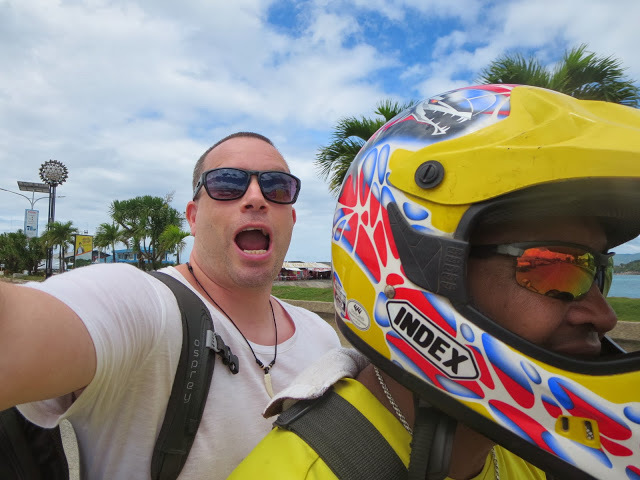 I was ready to keep moving on when he said he would take me on his motorcycle for 1000 pesos. This I could not turn down! 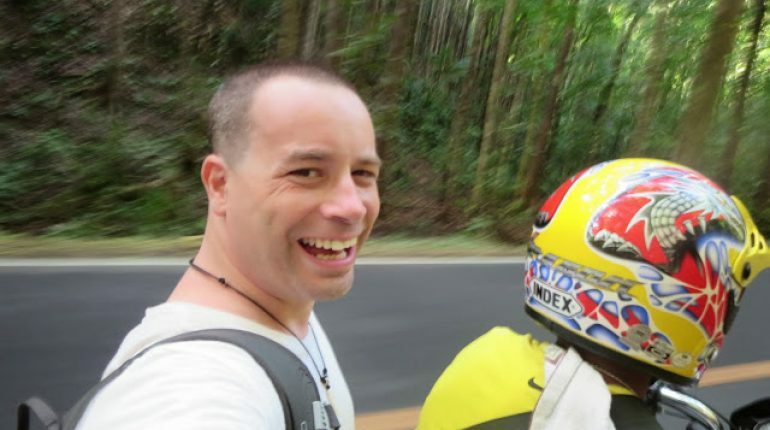 I have never been on a motorcycle and I couldn’t think of a more perfect time to go on my first ride on the beautiful island of Bohol. 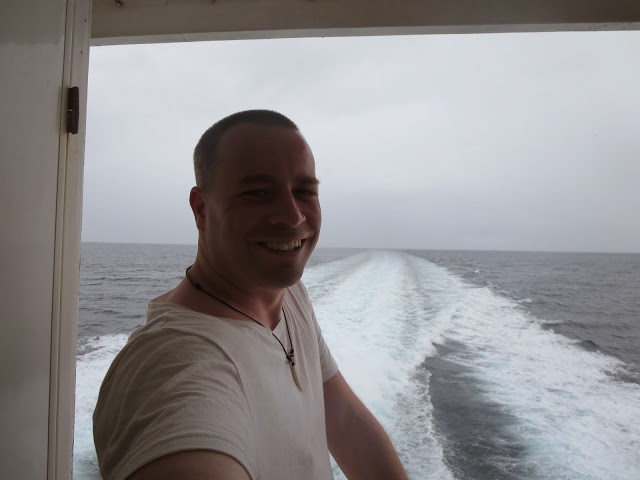 Of course I had my all my hair shaved off earlier in the week in Palawan so I can’t really say it was great to feel the wind flowing through my hair but I will say it was an amazing way to see the island. Because of the wind you didn’t actually feel how hot it actually was outside (yes, I loaded up on sunscreen this time). 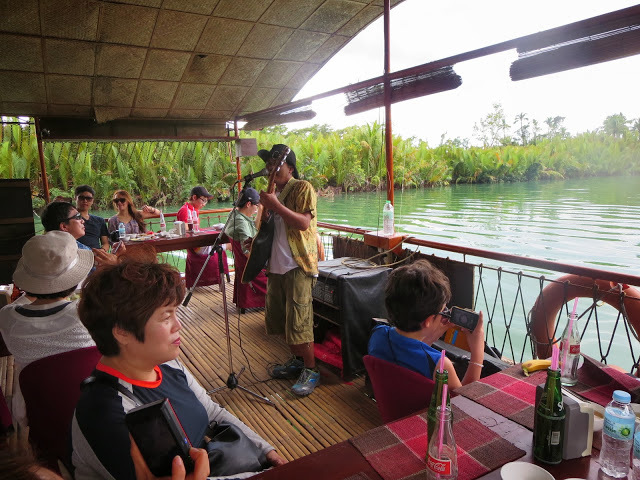 As I was starving we made our first stop the Loboc river cruise. Rey dropped me off and waited for me as I boarded one of the floating restaurants for a buffet lunch (392 pesos, $10). After we all ate the boat left the dock for a half hour ride down the river and back. While we cruised down the river a man serenaded the passengers with his guitar playing and singing of classic songs from the 60’s and 70’s with a heavy emphasis on Beatles songs. In the middle of the cruise the boat docked where a tribe of local villagers were ready to entertain us. Dressed in native garb they played the drums, breathed fire and sold souvenirs. I bought a little Bohol sunflower magnet. By 2pm we were back on the road heading towards the Tarsier Conversation Area. The tarsier is a cute little nocturnal animal with big eyes. 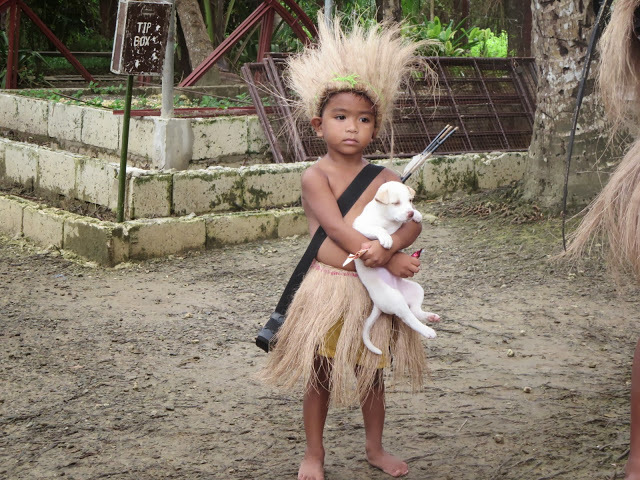 When I was first reading about what to do in the Philippines I saw a picture of one and I knew I had to go here. What can I say? I’m a sucker for cute little animals! 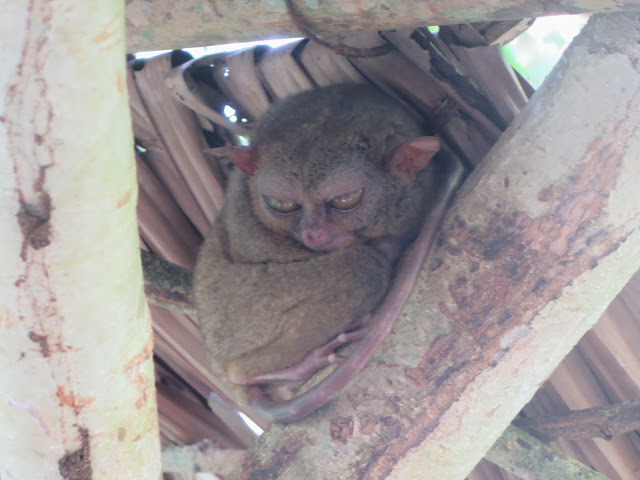 I only saw four in the little forest viewing area they had set up and they weren’t the easiest to spot – the tarsier is really small and kind of curls up around the tree branches. 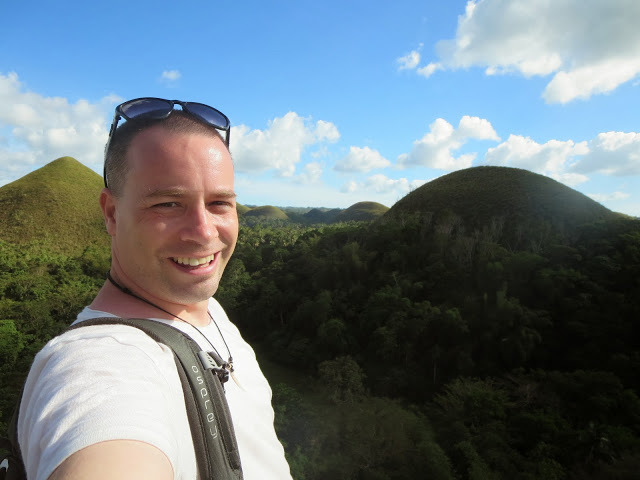 We then headed to the other big thing here in Bohol – the Chocolate Hills. On our way we drove through the Man Made Forest, a 2km stretch of mahogany trees planted over 50 years ago. It was so nice to ride for a bit in the nice cool shade afforded by the tall trees. Next on the list was the Butterfly sanctuary – a small place that’s part natural habitat and part museum. I paid my entrance fee and was given a guide to show me through the place. My guide was 19 and was actually a pretty funny guy. 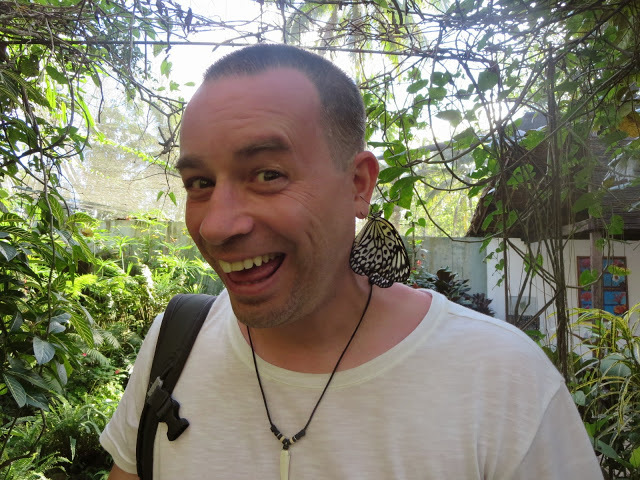 He even brought a butterfly over to hang on my nose and my ear. Pretty cool tour. Last stop on the tour was the Sipatan twin hanging bridges. Kinda meh. You walk over one bridge and back on the other one, take a couple of photos and it’s all done in less than 10 minutes. It was now 4:30pm and we headed back to the ferry port so I could catch the last ferry at 6pm. I didn’t realize how far out we had driven as it took over an hour to get back. Overall, it was a great day. Sure it started pretty stressful but once I was on the back of that motorcycle I was smiling ear to ear. 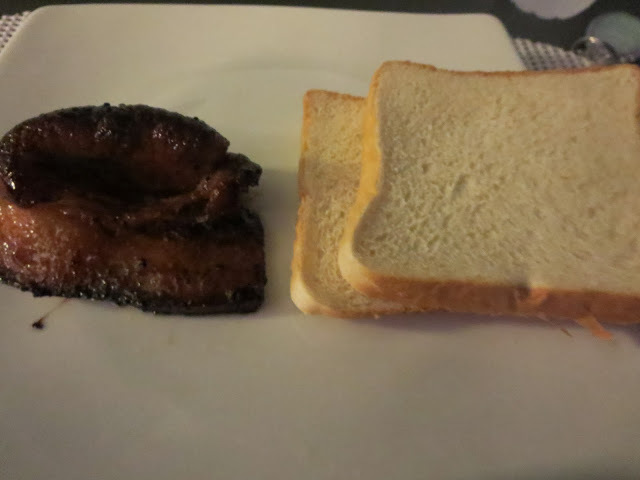 I finally got back to the hostel at 9pm, had a ridiculous meal of pork chop with white bread in the upstairs hostel restaurant and was in bed by 10pm. Tomorrow I leave for Boracay bright and early. Time to relax on a beautiful island again.